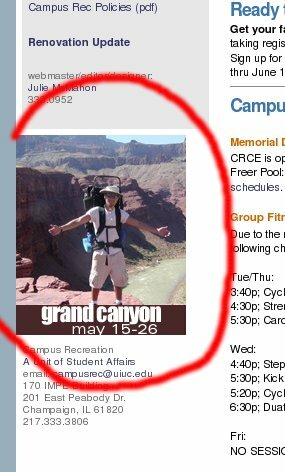 Welcome to my Grand Canyon 2006 website. You can read some history below, or you can jump to the various sections of the site by clicking on the links above. I suggest going to the itinerary/journal section. Then, just click on the excerpt from the first day's journey and you can read the entire journal that I kept for the trip. If you have suggestions for things that should be on here, by all means, let me know. Have fun, and enjoy your visit! I first saw the Grand Canyon in 2004, two years before the trip discussed here. In July of 2004, I went on a very large whirlwind tour of "the west". In 2.5 weeks we traveled from Missouri and headed for Salt Lake City. From Salt Lake to: Crater Lake, the Oregon Coast, the Redwoods, San Francisco, the Sequoias, Yosemite, Las Vegas, Hoover Dam, Zion Canyon, Bryce Canyon, Escalante Staircase, Glen Canyon, the Grand Canyon, the Petrified Forest, 4 Corners, and then back home to Missouri. We actually skipped several of the sites we had planned to see, including Arches, Mesa Verde, Great Sand Dunes in Colorado, Colorado Springs, and Death Valley. We had just crammed more into the time than we could do. But, the group was large (16 of us), and this let us see all of these sites that few of us had ever seen before. Personally, I looked at the trip as a "recon" mission, so that I could decide what other sites I wanted to go back to in the future. Anyway, by the time we got to the Grand Canyon, our brains had already been numbed by the Amazing Sites drug. We got there, said to ourselves, "That's a big hole in the ground" and went on. We really didn't get the chance to appreciate it properly. ... there were a couple of years at IMPE [the local gymnasium] when people slept outside to sign up for the Grand Canyon trip. The backpacking trips tend to be popular. So, I expected that the trip would be full. I decided to send the email anyway, and learned that there were actually slots available, and they were having an organizational meeting that afternoon. As luck would have it, I was preparing for a major meeting at work, and had exactly zero spare time that day. So, I arranged to visit Bob later and discuss the trip. A coworker and myself went down and spent about an hour finding out more about the trip, watching a video, and seeing some of the suggested items to have. The next day, I decided to go. My coworker wimped out and decided to not go. Bounce over to the itinerary and journal section to continue.